It's Sunday morning, here at McMurdo--a day for sleeping in a little, checking and re-checking gear, and maybe going for a stroll around Ob' Hill before station wakes up for a mid-day brunch. 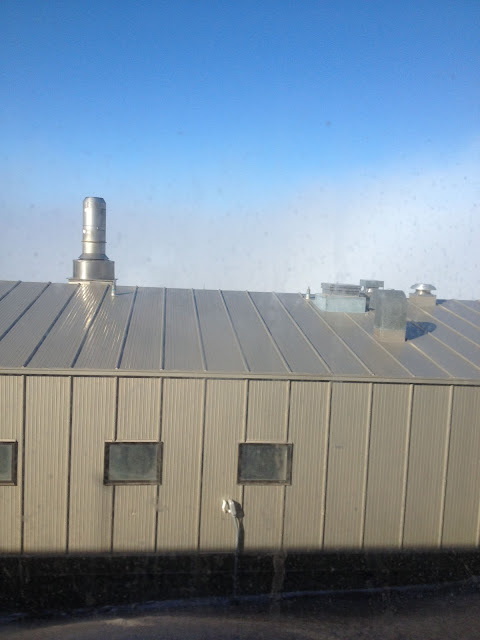 Imagine my surprise, when I awoke this morning and headed towards the Crary Laboratory: McMurdo Sound is socked in with thick fog. Normally, I should be able to look out my lab window and see the Dry Valleys and the Royal Society Range soaring up from above the Ross Sea. This morning, it's just thick, billowy white out there. Part of the Crary Laboratory building is in the foreground. 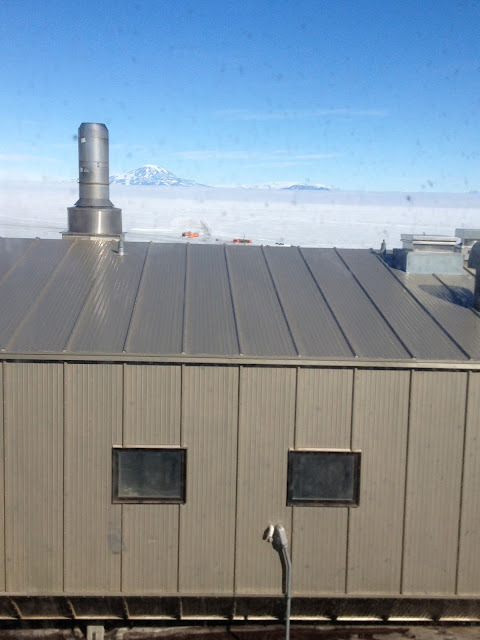 My guess is that the warm weather we've been having here at McMurdo (high temperature today: +4˚C or 39˚F) has led really humid air developing during the day (lots of snow and ice to melt). When temperatures drop at "night" (when the sun is low in the sky--but still above the horizon) to temperatures below freezing, all this moisture condenses out and forms the thick fog banks that can cut McMurdo off from the rest of the Ross Sea region. It's lovely, if a little mysterious, on a Sunday morning. But fog like this on a working day means no helo flights and no planes coming or going from Christchurch. I hope it clears up before Wednesday: we're hoping to fly across the sound on 12/12/12, and don't want to land at Camp Brigadoon. That's better. Mount Discovery is back, peeking out above the fog, along with the Kukri Hills (the low hills to the right).